Impaired Ag-presenting function in dendritic cells (DCs) due to abnormal differentiation is an important mechanism of tumor escape from immune control. A major role for vascular endothelial growth factor (VEGF) and its receptors, VEGFR1/Flt-1 and VEGFR2/KDR/Flk-1, has been documented in hemopoietic development. To study the roles of each of these receptors in DC differentiation, we used an in vitro system of myeloid DC differentiation from murine embryonic stem cells. Exposure of wild-type, VEGFR1−/−, or VEGFR2−/− embryonic stem cells to exogenous VEGF or the VEGFR1-specific ligand, placental growth factor, revealed distinct roles of VEGF receptors. VEGFR1 is the primary mediator of the VEGF inhibition of DC maturation, whereas VEGFR2 tyrosine kinase signaling is essential for early hemopoietic differentiation, but only marginally affects final DC maturation. SU5416, a VEGF receptor tyrosine kinase inhibitor, only partially rescued the mature DC phenotype in the presence of VEGF, suggesting the involvement of both tyrosine kinase-dependent and independent inhibitory mechanisms. VEGFR1 signaling was sufficient for blocking NF-κB activation in bone marrow hemopoietic progenitor cells. VEGF and placental growth factor affect the early stages of myeloid/DC differentiation. The data suggest that therapeutic strategies attempting to reverse the immunosuppressive effects of VEGF in cancer patients might be more effective if they specifically targeted VEGFR1. Vascular endothelial growth factor (VEGF)3 is recognized as a key factor in normal and abnormal angiogenesis regulating multiple biological responses in endothelial cells, including cell proliferation, migration, survival, and production of vasoactive mediators. VEGF is produced by almost all tumor cells (1), and is found in the serum of cancer patients (2) as well as in tumors (3). VEGF binds two major receptors, VEGFR1/Flt1 and VEGFR2/KDR/Flk1, both members of the platelet-derived growth factor receptor subfamily of the receptor tyrosine kinase superfamily (reviewed in Refs.4, 5, 6). Numerous studies have demonstrated that cells of nonendothelial origin express functional VEGFR. In vitro and in vivo clonogenic assays demonstrated the role of VEGF in lineage redistribution with a substantial shift toward formation of myeloid, mixed, and erythroid colonies from lineage-committed progenitors. At the same time, VEGF has been shown to inhibit colony formation from less mature pluripotent progenitors and stem cells (7, 8). Recently, VEGFR1 has been implicated in mobilization of bone marrow-derived cells (9), monocyte migration, and chemotaxis (10, 11, 12), and proposed as a novel cell surface marker for the the monocyte-macrophage lineage in humans (10, 11, 12, 13). Gene-targeting studies revealed that disruption of kinase domain in VEGFR1 impaired VEGF-dependent migration of macrophages, although it had no other major effects on homozygous mice (14). The role of VEGFR1 was demonstrated in regulation of the hemopoietic stem cell (HSC) cycle, differentiation, and cell recovery after bone marrow suppression; VEGFR1 signaling also promotes recruitment of HSCs and mobilization of myeloid progenitors into the peripheral blood and contributes to the optimal maturation of megakaryocytes (15, 16, 17). VEGFR1 mRNA and protein expression increases during monocytic and megakaryocytic differentiation of human CD34+ cells, but is down-regulated in erythroid development. In contrast, VEGFR2, while expressed on a small fraction of CD34+ cells, is rapidly down-regulated upon induction of hemopoietic differentiation (15). Studies on vegfr2−/− mice and embryonic stem (ES) cells determined that VEGFR2 was a crucial differentiation and clonogenic factor for hemangioblasts or blast colony-forming cells, which are the primitive common progenitors of hemopoietic and endothelial cells (18, 19, 20). Investigations of HSCs suggested that pluripotent HSCs were restricted to the CD34+VEGFR2+ cell fraction defining VEGFR2 as a positive functional marker for HSCs and distinguishing them from committed progenitors (21). The essential role of VEGF and VEGFR in hematopoiesis is underscored by the fact that knockouts of VEGF or either of its receptors are embryonic lethal due to defects in early hemopoietic cell development (22, 23, 24). Studies using conditional tissue-specific targeting of the VEGF gene demonstrated that VEGF knockout HSCs lack repopulation potential, whereas VEGF regulated HSC survival by an internal (private) autocrine loop mechanism (25). An essential role for signaling via VEGFR1 in this process was reported, thus identifying a novel intracellular function of this receptor. Using an in vitro model of dendritic cell (DC) differentiation from ES cells, we show that the in vivo effects of VEGF on hemopoietic differentiation can be effectively dissected genetically. Acquired pathologic levels of VEGF observed in cancer patients have profound effects on the maturation of myeloid DC, and in this study we demonstrate that VEGFR1 is the primary mediator of the VEGF inhibition of DC maturation, and that kinase inhibition with SU5416 does not overcome this effect. Six- to 8-wk-old female BALB/c and C57BL/6 mice were purchased from Harlan Breeders and housed in pathogen-free units of the Division of Animal Care at Vanderbilt University. Placental growth factor (PlGF) was delivered into mice via osmotic pumps for 28 days, at an infusion rate of 100 ng/h, as described previously (8, 26). Blood concentration of PlGF was measured on day 28 using ELISA kit (R&D Systems). VEGFR1−/− (clone GG5−/−) (24) and VEGFR2−/− (clone 5548) (23) ES cells are of R1 origin (129 mice) and were generously provided by G. Fong (University of Connecticut Health Center) and J. Rossant (Mount Sinai Hospital), respectively. Matching wild-type R1 cells were obtained from the Vanderbilt University Embryonic Stem Cell Shared Recourse. ES cells were cultured on gelatinized plates with a feeder layer of mouse embryonic fibroblasts in DMEM supplemented with pyruvate and glutamine, 15% FBS (HyClone), 10−5 M 2-ME, antibiotic/antimycotic (Invitrogen Life Technologies), and 10 μg/ml LIF (StemCell Technologies). DCs were generated using a published protocol (27), with some modifications. Briefly, ES cells were passaged on gelatinized plates without feeder layers and collected by trypsinization. A total of 106 cells was transferred into 6-cm low-adherence petri dishes and cultured for 12–14 days in medium without LIF to allow formation of embryoid bodies (EBs). Two to four individual EBs were micromanipulated into wells of 24-well tissue culture plate in the medium containing the following mouse cytokines: 25 ng/ml GM-CSF and 10 ng/ml IL-3 with or without 25 ng/ml VEGF, 50 ng/ml PlGF, or 4 μM SU5416. Within the next 12–14 days, phenotypically distinct colonies of immature DC appeared around some EBs, and these were counted as immature DC producing. The frequency of these EBs was expressed as percentage of total EB number. Immature DCs were collected by gentle suspension and cultured in a new plate with the same cytokines for 3 days. Medium was then replaced, and the following cytokines were added: 20 ng/ml GM-CSF, 5 ng/ml IL-4, and 10 ng/ml TNF-α with or without VEGF, PlGF, or SU5416. In some experiments, LPS was added instead of TNF-α. Mature DCs appeared by day 3 and increased in number until days 7–9, when they were analyzed for the phenotype and function. For the wild-type ES cells, 50–65% of EBs produced immature DCs, and the population of mature DCs contained up to 85% of CD11c+ cells. During the period of culture, one-half of the medium in each culture was replaced with the fresh medium each 3–4 days. NIH3T3 fibroblasts overexpressing human VEGFR1 (3T3/VEGFR1, clone NIH3T3-Flt (1)-3) (28) were provided by M. Shibuya (University of Tokyo). HUVECs were purchased from BioWhittaker/Clonetics and cultured in endothelial growth medium-2 medium (BioWhittaker/Clonetics). Passages four to six were used in the experiments. Human CD34+ progenitor cells were isolated from umbilical cord blood or bone marrow of healthy donors by positive selection using CD34 immunomagnetic beads (Dynal Biotech) or MACS columns (Miltenyi Biotec), according to manufacturers’ protocols. The purity of CD34+ cells was >90%, as estimated by flow cytometry with anti-CD34 Ab. Cells were cultured overnight in RPMI 1640 containing 10% FBS, 10−5 M 2-ME, and antibiotic/antimycotic supplemented with 10 ng/ml human GM-CSF. Cells were collected, washed in serum-free RPMI 1640 medium, and used for further studies. For purification of mouse HPCs, bone marrow was flushed out of femurs and tibias of mice. Lineage-positive cells were depleted by incubation with Abs against CD5, CD11b, CD45R, Gr1, and Ter119, and subsequent complement-dependent lysis (Low-Tox Guinea Pig Complement; Cedarlane Laboratories). Lysed cells were removed by centrifugation over a Lympholyte gradient (Cedarlane Laboratories). Cells at the interface were collected, washed, and cultured overnight in the above medium supplemented with 10 ng/ml murine GM-CSF. Cells were then washed and used for additional experiments. DC functional activity was assessed by MLR, as described previously (8). Briefly, responder T cells were isolated from spleen of allogeneic unprimed C57BL/6 mice. Red cells were removed from the single cell suspension of splenocytes by hypotonic shock. T cells were further enriched by labeling with anti-MHC class II Ab (TIB 12 hybridoma; American Type Culture Collection collection) and Abs against CD11b, CD45, and Gr1, followed by complement-dependent lysis and gradient centrifugation over a Lympholyte gradient. ES cell-derived DC cells were plated at 5000 cells/well of 96-well plate and cultured with T cells at various ratios for 4 days. Eighteen hours before harvesting, cells were pulsed with 1 μCi of [3H]thymidine (Amersham). Cells were then harvested on glass fiber filters, and incorporation of [3H]thymidine was measured by scintillation counting. Human VEGF was labeled by Cy3 (Amersham Biosciences), according to manufacturer’s protocol. The molar dye/protein ratio estimated by absorbance at 552 and 280 nm was 4:1. The 3T3/VEGFR1 cells, suspended by treatment with Detachacell (Invitrogen Life Technologies), or HPCs were incubated with 100 ng/ml Cy3-labeled VEGF in PBS containing 1% of horse serum with or without 5 μg/ml unlabeled human VEGF or PlGF for 45 min at 4°C or 37°C. Cells were washed twice with cold PBS and assayed by flow cytometry. Cy3-labeled BSA at the same concentration was used as a negative control. For immunofluorescent microscopy, 3T3/VEGFR1 cells were grown in slide chambers, washed, and incubated as above at 4°C or 37°C. Alternatively, cells were preincubated with 1 μg/ml methyl-β-cyclodextrin for 30 min. Slides were washed twice with PBS, air dried, mounted, and analyzed by confocal microscopy (Zeiss LSM410 microscope). HPCs were treated, as indicated in text, pelleted, washed with cold PBS, and lysed in a buffer containing 20 mM Tris, pH 7.4, 1% Nonidet P-40, 150 mM NaCl, 10% glycerol, 20 mM NaF, 1 mM Na-orthovanadate, and protease inhibitor tablets (Roche/Boehringer). Protein concentration was estimated by Bradford method (Bio-Rad). Lysates (20–40 μg) were separated by 10% SDS-PAGE, and protein was transferred onto polyvinylidene difluoride membrane (Millipore). Membranes were incubated with anti-IκBα or anti-phospho-IκBα Abs (Santa Cruz Biotechnology), and bands were visualized using peroxidase-labeled secondary Abs and ECL (Amersham Biosciences). EMSA was performed, as described previously (29). Nuclear extracts were obtained from the cells, as described previously (30), and 5 μg of nuclear extracts was incubated for 10 min with 32P-labeled probe (100,000 cpm) in the presence of 4 μg of poly(dI-dC) (Amersham Biosciences) in binding buffer (20 mM HEPES, 5% glycerol, 0.2 mM EDTA, 1 mM DTT, 5 mM MgCl2). Competition assays were performed with 100-fold excess of unlabeled probes. The DNA-protein complexes were separated on 4% polyacrylamide gel and visualized by exposure to x-ray film. ELISA kit from R&D Systems was used for measuring VEGF in ES/EB cultures. Human and mouse GM-CSF, IL-3, IL-4, TNF-α, VEGF165, and VEGF162, respectively, PlGF, and goat-neutralizing anti-mouse VEGF, VEGFR1, and VEGFR2 Abs were purchased from R&D Systems. For fluorescent labeling, we used human VEGF provided by Genentech. Goat IgG and LPS were from Sigma-Aldrich; anti-IκBα, anti-phospho-Ser32 IκBα, and anti-VEGFR2 for Western blotting Abs were from Santa Cruz Biotechnology; anti-VEGFR1 mAb for Western blotting was from Abcam; anti-phosphotyrosine mAb p20, unlabeled and fluorescent-labeled Abs against cell surface markers, CD3, CD5, CD11b, CD11c, CD45R, Gr1, and Ter119 were from BD Pharmingen. To identify the type of VEGFR present on HPCs and the fate of the ligand upon binding to the receptor, we used VEGF labeled with Cy3 fluorescent dye. To prove the specificity of VEGF-Cy3binding, we used well-characterized NIH3T3 fibroblasts overexpressing VEGFR1 (13, 28). VEGF-Cy3 strongly binds to VEGFR1-expressing cells, but not to normal NIH3T3 fibroblasts (data not shown), which do not express VEGFR. Both unlabeled VEGF and PlGF, a VEGFR1-specific ligand, effectively block this binding. Human CD34+ cells and mouse HPCs show definite binding of VEGF-Cy3 (Fig. 1⇓A), although at a low level consistent with low receptor numbers on these cells. 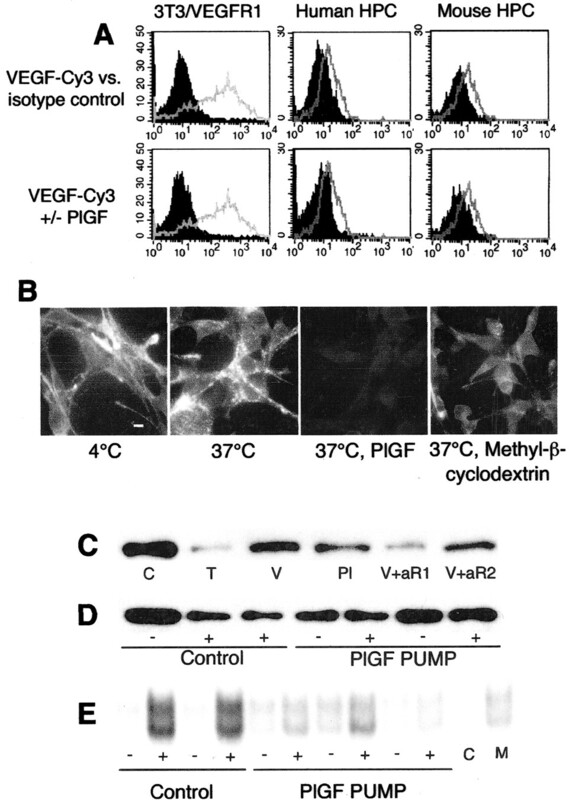 Unlabeled PlGF efficiently inhibits this binding, implicating VEGFR1 as the major VEGFR on HPCs. As a control, we confirmed that a 100-fold excess of unlabeled epidermal growth factor that should not bind to VEGFR did not abrogate VEGF-Cy3 binding (data not shown). It should be noted that these experiments indicate that majority of the ligand binding is mediated by VEGFR1. However, the experiments do not exclude the presence of a small VEGFR2-expressing cell fraction identified in other studies (15, 21), as visualization of these cells was beyond the sensitivity of the method. VEGFR1 is expressed on HPCs and is capable of mediating ligand internalization. A, Overlay of histograms for 3T3/VEGFR1 cells or bone marrow human CD34+ and mouse lineage-negative HPCs incubated with 100 ng/ml Cy3-labeled VEGF (open histogram) over cells incubated with Cy3-labeled BSA, as a negative control (upper panel, filled histogram) or cells stained with VEGF-Cy3 in presence of 5 μg/ml unlabeled PlGF (lower panel, filled histogram) at 4°C. B, 3T3/VEGFR1 cells incubated with 100 ng/ml Cy3-labeled VEGF at 4°C or 37°C for 45 min with or without 5 μg/ml unlabeled PlGF, or pretreated for 30 min with 1 μg/ml methyl-β-cyclodextrin, a reagent disrupting caveolae. C–E, VEGFR1 mediates inhibitory effect of VEGF on IκBα degradation and NF-κB activation in vitro and in vivo. C, Degradation of IκBα in cultured mouse HPCs stimulated with 10 ng/ml TNF-α in the presence of 25 ng/ml VEGF (V), 50 ng/ml PlGF (Pl), or VEGF (V) plus 10 μg/ml anti-VEGFR1 (aR1) or anti-VEGFR2 (aR2) neutralizing Abs. Degradation of IκBα (D) and NF-κB DNA binding (E) in HPCs from PlGF pump mice stimulated with TNF-α (+) or left untreated (−). C is excess of unlabeled probe; M is excess of mutant probe. Note that changes in the levels of IκBα and NF-κB DNA binding upon TNF-α stimulation are less in cells from PlGF-treated mice than from control animals. Bar, 10 μm. The experiments with Cy3-labeled VEGF and 3T3/VEGFR1 fibroblasts revealed receptor-mediated internalization of the ligand and effective competition by unlabeled PlGF (Fig. 1⇑B). Ligand evenly distributes on the cell surface at 4°C, as mechanisms of internalization are blocked at this temperature. However, at 37°C most of the ligand appears clustered intracellularly. Methyl-β-cyclodextrin, known to disrupt caveolae, abrogates internalization, leaving VEGF-Cy3 evenly distributed on the cell surface at 37°C, and indicating that this internalization is caveolae dependent. The NF-κB pathway plays a crucial role in the maturation of DCs. Our earlier in vitro studies demonstrated that VEGF interferes with the normal activation of IκB kinase and phosphorylation of the IκBα subunit of the NF-κB complex (29, 31). To determine whether it is VEGFR1 or VEGFR2 that transduces this effect, we assessed induction of IκBα degradation by TNF-α in the presence of VEGF, PlGF, and blocking Abs to either VEGFR1 or VEGFR2. Both ligands significantly inhibit TNF-α-induced degradation of IκBα (Fig. 1⇑C). VEGFR1-specific Abs, but not anti-VEGFR2 Abs, reverse the inhibition by VEGF, thus confirming the role of VEGFR1 in mediating this effect. We have previously reported that continuous infusion of VEGF via an osmotic pump impairs the TNF-α-induced activation of NF-κB in bone marrow progenitor cells in mice (8). To confirm the role of VEGFR1 in vivo, we studied the consequences of continuous infusion of PlGF. The selected infusion conditions resulted in PlGF serum concentrations of 100–120 ng/ml. After 28 days of PlGF infusion, bone marrow HPCs from control mice and PlGF-infused animals were purified and stimulated with TNF-α, and nuclear proteins were assessed for NF-κB DNA binding. HPCs from PLGF mice showed remarkably decreased degradation of IκBα and induction of NF-κB compared with cells from control mice (Fig. 1⇑, D and E). These data support the role of VEGFR1 in blocking NF-κB activation in HPCs in vivo. To more definitively establish the contribution of each of the VEGFR in DC development, we used an in vitro model of DC differentiation from mouse ES cells with targeted disruption of each of the receptor genes. 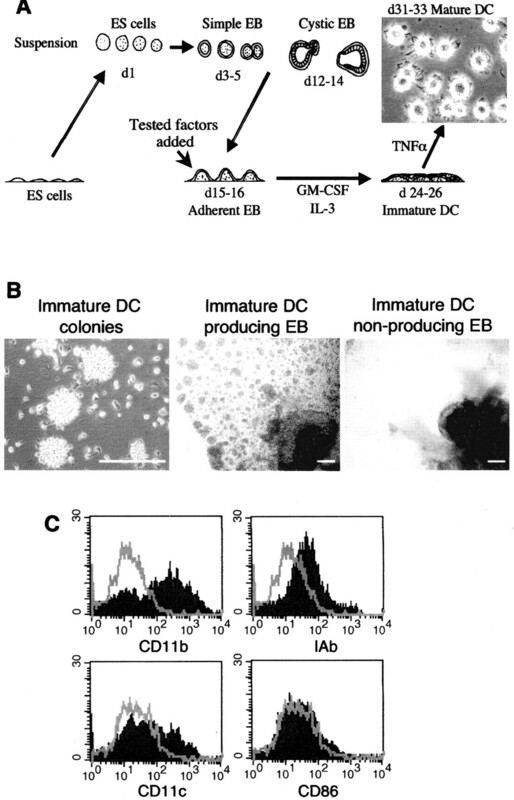 These cells can be induced to form EBs in suspension culture, and culturing these EBs in combinations of cytokines promotes DC differentiation (Fig. 2⇓A). GM-CSF and IL-3 induce the formation of phenotypically distinct colonies of immature DC (Fig. 2⇓B) expressing the myeloid marker CD11b and low levels of MHC class II (Fig. 2⇓C). When replated and cultured with GM-CSF, IL-4, and TNF-α, or LPS instead of TNF-α, the culture yields mature DCs. We were typically able to generate a cell population wherein up to 85% of cells expressed CD11c and high levels of MHC class II Ags, as well as the costimulatory molecules, CD86, CD80, and CD40 associated with high functional activity (Fig. 3⇓). In vitro generation of DCs from mouse ES cells. A, Scheme of the process including microphotograph of mature DCs. B, Microphotographs of colonies and individual immature DC cells and immature DC-producing and nonproducing EBs. C, Flow cytometry analysis of surface marker expression on immature DCs. Filled histograms, staining with specific Ab; open, isotype control. Bar, 500 μm. Phenotype (A) and functional assay by MLR (B) of ES cell-derived DCs and the inhibitory effects of VEGF and PlGF. Mature DCs were generated with or without 25 ng/ml VEGF or 50 ng/ml PlGF. Percentage of double-positive cells is indicated. A, Representative of at least three different experiments. MLR was performed, as described in Materials and Methods. DC differentiation from ES cells is characterized by two distinct phases: the formation of immature DCs and final maturation of these cells into DCs. Thus, we used two parameters to characterize each differentiation process: the frequency of generation of immature DCs by EBs and the proportion of cells with a mature DC phenotype in the final cell population. Using these end points, we investigated the effects of growth factors and receptor gene knockouts on DC differentiation. The frequency of immature DC production, as assessed by the number of EBs generating immature DC colonies, was similar for wild-type and VEGFR1−/− cells (Fig. 4⇓A). The disruption of VEGFR2, however, dramatically decreased the ability of EBs to generate immature DCs. Nevertheless, immature DCs of either origin when replated and cultured yielded mature DCs with similar efficiency (Fig. 4⇓B). Effect of VEGF, PlGF, SU5416, and anti-VEGF-blocking Ab on efficiency of generation of immature and mature DCs from wild-type, VEGFR1, or VEGFR2 knockout ES cells. A, Frequency of immature DC colony formation. B and C, Flow cytometry analysis of the expression of surface markers on mature DCs produced from wild-type or VEGFR knockout cells with or without 25 ng/ml VEGF or 50 ng/ml PlGF. B, Shows results of a representative experiment with percentage of double-positive cells indicated; A and C, Average values from three to five experiments. The genetic studies described above clearly indicate the requirement for VEGF signaling in the generation of immature DC. As no exogenous VEGF was added in these experiments, this suggests the presence of ligand in the EB cultures. We measured the levels of VEGF by ELISA in the supernatants of adherent EB cultures after 6 days, before the appearance of immature DCs, and after 16 days when immature DCs have developed and expanded. The levels of VEGF in cultures of wild-type EBs were 30.0 ± 7.5 and 498.5 ± 145.4 pg/ml (n = 6) at these two time points. The addition of anti-VEGF-blocking Abs to EB cultures remarkably decreased efficiency of immature DC generation (Fig. 4⇑A). Collectively, these data implicate VEGF autocrine/paracrine signaling in EB and immature DC differentiation. The addition of exogenous VEGF or PlGF to cultures of adherent EBs decreased both the number of immature DC-producing EBs (Fig. 4⇑A) and the percentage of mature DCs in wild-type cells. These were associated with decreased functional activity assessed by MLR (Fig. 3⇑B). At the concentrations used, VEGF consistently demonstrated a stronger negative effect as determined by expression of CD11c, CD40, CD86, and MHC class II surface markers (Figs. 3⇑A and 4⇑B). 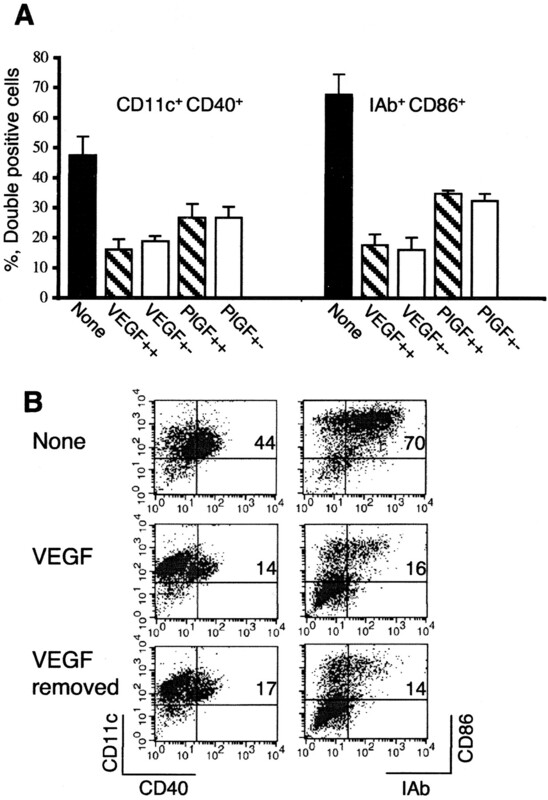 In VEGFR1−/− cells, however, PlGF did not have any effect at all, and that of VEGF was far less pronounced (Fig. 4⇑, B and C). Addition of either VEGF or PlGF to VEGFR2 knockout cells tended to further decrease the frequency of immature DC production (Fig. 4⇑A). These cells were similarly responsive to both ligands with regard to the proportion of mature DCs, but to a somewhat lesser degree than wild-type cells (Fig. 4⇑, B and C). Thus, these data suggest that while VEGFR2 signaling by low levels of autocrine-paracrine VEGF is important for the production of immature DCs, the presence of high levels of VEGF inhibits production of immature DCs. Signaling by endogenous VEGF through VEGFR1 has little effect on the number of EB or DC maturation, but mediates inhibition of maturation in the presence of high ligand concentrations. VEGFR2 is known to possess a potent ligand-dependent kinase activity. To assess the role of VEGFR kinase activity in mediating the inhibitory effect of VEGF, we used the small molecule kinase inhibitor SU5416, which efficiently blocks the tyrosine kinases of both VEGFR1 and VEGFR2 by interfering with ATP binding (32, 33). 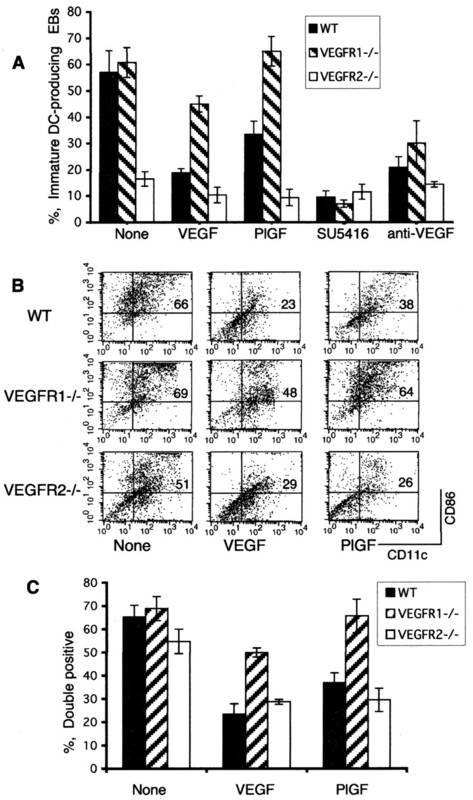 Addition of SU5416 to the ES cultures reduces the number of immature DC-producing EBs in both wild-type and VEGFR1−/− cells down to levels close to untreated VEGFR2 knockout cells (Fig. 4⇑A). This indicates that VEGFR2 promotes the production of immature DC colonies via its kinase activity. VEGFR phosphorylation can hardly be assessed directly in HPCs because of low numbers of receptor molecules. To prove that the selected dose of SU5416 inhibits both VEGFR, we used NIH3T3 cells overexpressing VEGFR1 or HUVEC known to express high levels of VEGFR2. As shown in Fig. 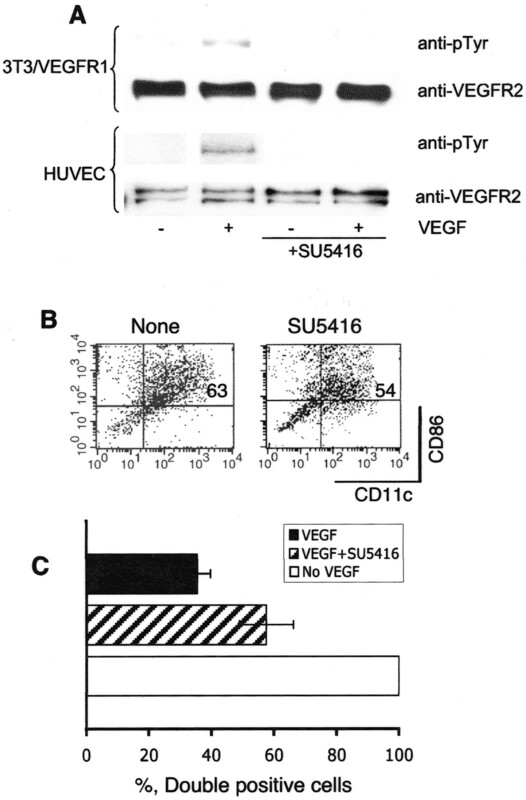 5⇓A, SU5416 effectively abolishes phosphorylation of both VEGFR1 and VEGFR2 at 4 μM. When applied in the absence of VEGF, SU5416 only slightly decreases the proportion of mature DCs (Fig. 5⇓B). However, at the dose associated with complete kinase inhibition, SU5416 only partially reverses the effects of VEGF and increases the proportion of mature DCs by about one-third (Fig. 5⇓C). This implies the involvement of both kinase-dependent and independent mechanisms in mediating VEGF-induced inhibition of DC differentiation. SU5416 effectively inhibits VEGFR1 and VEGFR2, does not prevent DC maturation, and partially rescues mature DC phenotype in the presence of VEGF. A, Inhibition of VEGFR1 and VEGFR2 phosphorylation in 3T3/VEGFR1 and HUVEC. Cells were stimulated with 25 ng/ml VEGF for 10 min (+) or left untreated; tyrosine phosphorylation was assessed by Western blotting with anti-phosphotyrosine Ab, as described in Materials and Methods. B and C, Mature DCs were generated from wild-type ES cells in the presence of 25 ng/ml VEGF with or without 4 μM SU5416 and analyzed by flow cytometry for the expression of surface markers. B, Results representative of three experiments with the percentage of double-positive cells indicated. C, Average percentage of double-positive cells from three experiments; 100% corresponds to VEGF-untreated cells either with or without SU5416. We investigated whether the continuous presence of high doses of VEGF during DC differentiation is essential for its inhibitory effect. When VEGF was present in EB cultures, but removed from immature DC cultures, the outcome was similar to that observed when VEGF was present continuously throughout in vitro culture (Fig. 6⇓A). When we added VEGF to immature DCs obtained from EBs without VEGF treatment, the proportion of mature DCs did not change in comparison with cultures with no VEGF added. The addition of anti-VEGF-blocking Abs to immature DCs did not affect the production of mature cells either. VEGF affects early stages of DC differentiation. Mature DCs were generated from wild-type ES cells with 25 ng/ml VEGF or 50 ng/ml PlGF presented either throughout the course (++) of differentiation or removed before final maturation of immature DCs into mature cells (+−) and assayed for the expression of surface markers. A, Average percentage of double-positive cells from three experiments; B, results of a representative experiment with percentage of double-positive cells indicated. VEGF signaling is an important factor regulating the development and function of hemopoietic cells. Our recent data, as well as data published by others implicate VEGF in important immune suppressive mechanisms, including impairment of DC differentiation (34, 35, 36, 37). We have identified VEGFR1 as the major VEGFR expressed on the surface of human CD34+ and mouse lineage-negative HPCs. The sensitivity of our cell staining with fluorescent-labeled VEGF was not adequate to detect ligand binding associated with VEGFR2 in HPCs. However, other studies demonstrated expression of VEGFR2 on a subset of CD34+ cells defined as pluripotent hemopoietic stem cells (15, 21), which give rise to more committed CD34+ HPCs lacking VEGFR2. Among VEGF effects, we have earlier identified impaired induction of NF-κB as being associated with inhibition of DC development (8, 34). Now using the VEGFR1-specific ligand PlGF, a PlGF infusion animal model, and VEGFR-specific neutralizing Abs, we show that VEGFR1 signaling is responsible for most of the observed effects on IκBα degradation and NF-κB activation both in vivo and in vitro. Collectively, these experiments strongly implicate VEGFR1 as the major mediator of VEGF effects on the NF-κB pathway in HPCs. Mouse ES cells with VEGFR knocked out allowed studies of DC maturation in the presence or absence of each receptor. This is impossible to accomplish in intact animals, as these variants are lethal in early development. Hemopoietic development within the EBs is efficient, highly reproducible, and follows a pattern similar to that found in vivo (38, 39), thus representing a relevant model for studying DC differentiation. Mature DCs that we generated are phenotypically very similar to DCs generated from mouse bone marrow HPCs and ES cell-derived DCs described in two other publications (27, 40), with CD11c levels reaching 85%. In our experience of working with this system, we have found two useful end points that correlate well with different steps of in vivo DC generation. As immature DCs express CD11b, a myeloid cell marker, we think that the number of EBs producing immature DC more broadly relates to the development of myeloid lineage. In contrast, the acquisition of the surface phenotype of mature DCs from the immature DCs seems to recapitulate lineage commitment and the final stages of DC maturation. Both of these stages are affected by elements of the VEGF ligand-receptor system. Without exogenous VEGF, VEGFR1 knockout ES cells produced the same number of immature DC colonies as wild type, but VEGFR2 knockout cells produced 5-fold fewer colonies (Fig. 4⇑A). This is analogous to the situation observed in knockout embryos in which the vegfr1−/− embryos have many more hemopoietic cells than vegfr2−/− embryos (24). Blocking of VEGF signaling with anti-VEGF Abs substantially decreased colony formation in all three cell types. These results underscore the importance of both autocrine VEGF production and VEGFR2 signaling for hemopoietic differentiation within EBs. Using ELISA, we found that developing EBs produce and secrete VEGF in culture medium. Similarly, VEGF release was detected in ES cell culture (41) and cultures of megakaryocytic and erythroid precursors (15). Combined, these data underscore the importance of VEGF autocrine signaling and the requirement for low VEGF concentrations for normal hemopoietic differentiation. Although the generation of immature DC seems to be highly dependent on VEGF signaling via VEGFR2, we suggest that blockade of VEGFR2 signaling impairs hemopoietic commitment in general rather than specifically interfering with myeloid or DC differentiation. This is because VEGFR2 is only transiently expressed during EB development (18, 42, 43, 44, 45) and only on pluripotent hemopoietic stem cells, while more committed HPCs lack VEGFR2 expression (15, 21). Despite the differences in their frequency of generation, immature DCs from ES cells in which either receptor was knocked out were still capable of differentiating into mature DCs. VEGF levels are greatly elevated in the blood of cancer patients and tumor-bearing animals, and this elevation is associated with impaired DC maturation (34, 46). 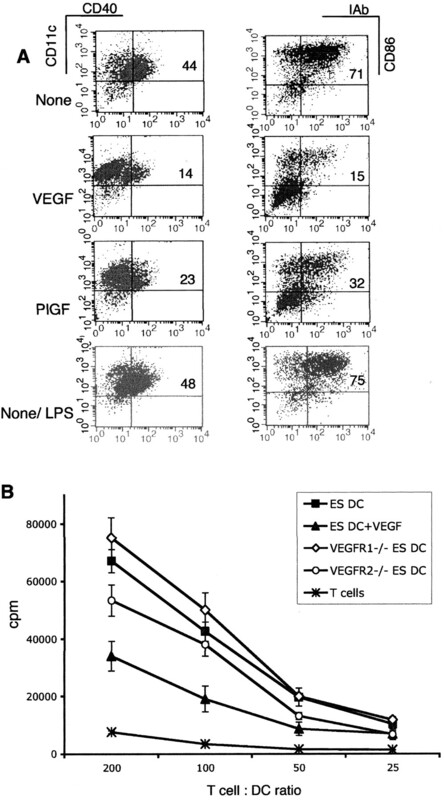 At higher concentrations of exogenous VEGF or PlGF, 50- to 100-fold exceeding autocrine VEGF production in EB cultures, the frequency of immature DCs and the proportion of cells with a mature DC surface phenotype were decreased, with VEGF having stronger inhibitory effects than PlGF (Fig. 4⇑). This accurately recapitulates the effects observed after prolonged VEGF exposure in vivo and confirms the relevance of the ES cell-derived DC model. In contrast to wild-type ES cells, when VEGFR1−/− ES cells were exposed to PlGF, no effect was observed at all, and effects of VEGF exposure were also far less pronounced. In contrast, both VEGF and PlGF similarly inhibited DC maturation from VEGFR2 knockout cells. Thus, our data clearly demonstrate that it is VEGFR1 that predominantly inhibits differentiation of DCs rather than VEGFR2, as VEGF retains its inhibitory effect in VEGFR2−/− cells. The experiments with addition and removal of VEGF at various time points revealed that VEGF affects early stages of myeloid commitment. Adding VEGF during the process of immature DC generation causes irreversible alterations in efficiency of mature DC production, but adding VEGF to a culture to drive immature DCs to mature DCs causes no alteration. Also, blocking of VEGF signaling with neutralizing anti-VEGF Abs during maturation of immature DCs did not change the proportion of mature DCs either. Lack of the effects of VEGF addition or blocking on maturation of immature DCs into mature DCs indicates that VEGF is neither positive nor negative regulator of this process. Instead, it exerts its inhibitory effect on earlier stage of formation of immature DCs, and immature DCs generated in the presence of VEGF already bear the alterations that prevent them from normal maturation into functional DCs. This is in agreement with our previous observation on bone marrow HPC differentiation, showing that the presence of VEGF at the very beginning of in vitro DC differentiation is crucial for its effect on both DC phenotype and NF-κB induction (31). We used SU5416 to probe the role of the tyrosine kinase in mediating VEGF effects on each step of DC maturation from ES cells. Blocking of kinase activity in wild-type or VEGFR1−/− EBs brings the number of immature DC-producing EBs down to levels close to untreated VEGFR2−/− cells. This indicates that the majority of the VEGFR2 effect is transduced through its kinase. The crucial role of VEGFR tyrosine kinase activity for early hemopoiesis was also demonstrated in a recent study (25) in which VEGFR kinase inhibitors, including SU5416, showed remarkable reduction of colony formation by bone marrow cells. Despite its dramatic effect on the frequency of immature DCs, SU5416 does not prevent subsequent DC differentiation, as mature DCs can readily be generated in the presence of the inhibitor. The assessment of the impact of SU5416 on the acquisition of the mature DC phenotype in wild-type cells revealed only partial reversal of the VEGF effect. This may imply that both tyrosine kinase-dependent and independent signaling contribute to DC inhibition by VEGF. The SU5416-resistant mechanism appears to be responsible for the larger part of this effect. It is clear from other studies, including germline deletion of the kinase domain, that the VEGFR1 kinase is relatively weak and is not likely to be responsible for all of the receptor function. Thus, we attribute the majority of the kinase-independent signaling to VEGFR1. The mechanism of this nontyrosine kinase-mediated VEGFR1 signal transduction remains largely unknown and intriguing. Our experiments with NIH3T3 fibroblasts expressing VEGFR1 show that ligand binding to this receptor induces caveolin-dependent ligand internalization and support the idea that multiple mechanisms may be engaged upon ligand binding to VEGFR1. In view of the recent discovery of a VEGF internal (private autocrine) signaling mechanism (25), it is conceivable that the VEGF ligand-receptor complex may have intracellular functions after internalization. The results of this study reveal important and yet different roles of the two VEGFR in hemopoiesis and differentiation of immune cells. We have identified VEGFR1 as a major mediator of VEGF inhibitory effect on DCs independent of VEGFR2 and showed evidence that supports kinase-independent VEGFR activity in this process. Both of these findings are essential for understanding the mechanisms of immunosuppression and lead to the hypothesis that specific targeting of VEGFR1 might be an effective therapeutic strategy aimed at immune correction in cancer. We are very thankful to Drs. J. Rossant and G. H. Fong for providing ES cell lines, Dr. M. Shibuya for providing 3T3/VEGFR1 cells, and Dr. C. Pettepher, a Director of Vanderbilt Transgenic Mouse/ES Cell Shared Resource, the personnel of this facility, and, specifically, J. Neff and M. Dixon for the support in ES cell work. We thank Vanderbilt Imaging Core for the assistance with fluorescent microscopy, and Drs. D. Gabrilovich and H.-P. Gerber for reviewing the manuscript. ↵1 This work was supported by National Institutes of Health/National Cancer Institute Grants CA076321-06 (to D.P.C.) and Histiocytosis Association of America Grant (to M.M.D.). ↵3 Abbreviations used in this paper: VEGF, vascular endothelial growth factor; DC, dendritic cell; EB, embryoid body; ES, embryonic stem; HPC, hemopoietic progenitor cell; HSC, hemopoietic stem cell; PlGF, placental growth factor; VEGFR, VEGF receptor. Ferrara, N., K. Houck, L. Jakeman, D. W. Leung. 1992. Molecular and biological properties of the vascular endothelial growth factor family of proteins. Endocr. Rev. 13:18. Kondo, S., M. Asano, K. Matsuo, I. Ohmori, H. Suzuki. 1994. Vascular endothelial growth factor/vascular permeability factor is detectable in the sera of tumor-bearing mice and cancer patients. Biochim. Biophys. Acta 1221:211. Takano, S., Y. Yoshii, S. Kondo, H. Suzuki, T. Maruno, S. Shirai, T. Nose. 1996. Concentration of vascular endothelial growth factor in the serum and tumor tissue of brain tumor patients. Cancer Res. 56:2185. Zachary, I.. 2001. Signaling mechanisms mediating vascular protective actions of vascular endothelial growth factor. Am. J. Physiol. Cell Physiol. 280:C1375. Shibuya, M.. 2001. Structure and function of VEGF/VEGF-receptor system involved in angiogenesis. Cell Struct. Funct. 26:25. Robinson, C. J., S. E. Stringer. 2001. The splice variants of vascular endothelial growth factor (VEGF) and their receptors. J. Cell Sci. 114:853. Broxmeyer, H. E., S. Cooper, Z. H. Li, L. Lu, H.-Y. Song, B. S. Kwon, R. E. Warren, D. B. Donner. 1995. Myeloid progenitor cell regulatory effects of vascular endothelial cell growth factor. Int. J. Hematol. 62:203. Gabrilovich, D., T. Ishida, T. Oyama, S. Ran, V. Kravtsov, S. Nadaf, D. P. Carbone. 1998. Vascular endothelial growth factor inhibits the development of dendritic cells and dramatically affects the differentiation of multiple hematopoietic lineages in vivo. Blood 92:4150. Carmeliet, P., L. Moons, A. Luttun, V. Vincenti, V. Compernolle, M. De Mol, Y. Wu, F. Bono, L. Devy, H. Beck, et al 2001. Synergism between vascular endothelial growth factor and placental growth factor contributes to angiogenesis and plasma extravasation in pathological conditions. Nat. Med. 7:575. Clauss, M., H. Weich, G. Breier, U. Knies, W. Rockl, J. Waltenberger, W. Risau. 1996. The vascular endothelial growth factor receptor Flt-1 mediates biological activities: implications for a functional role of placenta growth factor in monocyte activation and chemotaxis. J. Biol. Chem. 271:17629. Barleon, B., S. Sozzani, D. Zhou, H. A. Weich, A. Mantovani, D. Marme. 1996. Migration of human monocytes in response to vascular endothelial growth factor (VEGF) is mediated via the VEGF receptor flt-1. Blood 87:3336. Waltenberger, J., J. Lange, A. Kranz. 2000. Vascular endothelial growth factor-A-induced chemotaxis of monocytes is attenuated in patients with diabetes mellitus: a potential predictor for the individual capacity to develop collaterals. Circulation 102:185. Sawano, A., S. Iwai, Y. Sakurai, M. Ito, K. Shitara, T. Nakahata, M. Shibuya. 2001. Flt-1, vascular endothelial growth factor receptor 1, is a novel cell surface marker for the lineage of monocytes-macrophages in humans. Blood 97:785. Hiratsuka, S., O. Minowa, J. Kuno, T. Noda, M. Shibuya. 1998. Flt-1 lacking the tyrosine kinase domain is sufficient for normal development and angiogenesis in mice. Proc. Natl. Acad. Sci. USA 95:9349. Casella, I., T. Feccia, C. Chelucci, P. Samoggia, G. Castelli, R. Guerriero, I. Parolini, E. Petrucci, E. Pelosi, O. Morsilli, et al 2003. Autocrine-Paracrine VEGF loops potentiate the maturation of megakaryocytic precursors through Flt1 receptor. Blood 101:1316. Hattori, K., B. Heissig, Y. Wu, S. Dias, R. Tejada, B. Ferris, D. J. Hicklin, Z. Zhu, P. Bohlen, L. Witte, et al 2002. Placental growth factor reconstitutes hematopoiesis by recruiting VEGFR1+ stem cells from bone-marrow microenvironment. Nat. Med. 8:841. Luttun, A., M. Tjwa, L. Moons, Y. Wu, A. Angelillo-Scherrer, F. Liao, J. A. Nagy, A. Hooper, J. Priller, B. De Klerck, et al 2002. Revascularization of ischemic tissues by PlGF treatment, and inhibition of tumor angiogenesis, arthritis and atherosclerosis by anti-Flt1. Nat. Med. 8:831. Choi, K., M. Kennedy, A. Kazarov, J. C. Papadimitriou, G. Keller. 1998. A common precursor for hematopoietic and endothelial cells. Development 125:725. Schuh, A. C., P. Faloon, Q. L. Hu, M. Bhimani, K. Choi. 1999. In vitro hematopoietic and endothelial potential of flk-1−/− embryonic stem cells and embryos. Proc. Natl. Acad. Sci. USA 96:2159. Shalaby, F., J. Ho, W. L. Stanford, K. D. Fischer, A. C. Schuh, L. Schwartz, A. Bernstein, J. Rossant. 1997. A requirement for Flk1 in primitive and definitive hematopoiesis and vasculogenesis. Cell 89:981. Ziegler, B. L., M. Valtieri, G. A. Porada, R. De Maria, R. Muller, B. Masella, M. Gabbianelli, I. Casella, E. Pelosi, T. Bock, et al 1999. KDR receptor: a key marker defining hematopoietic stem cells. Science 285:1553. Ferrara, N., K. Carver-Moore, H. Chen, M. Dowd, L. Lu, K. S. O’Shea, L. Powell-Braxton, K. J. Hillan, M. W. Moore. 1996. Heterozygous embryonic lethality induced by targeted inactivation of the VEGF gene. Nature 380:439. Shalaby, F., J. Rossant, T. P. Yamaguchi, M. Gertsenstein, X. F. Wu, M. L. Breitman, A. C. Schuh. 1995. Failure of blood-island formation and vasculogenesis in Flk-1-deficient mice. Nature 376:62. Fong, G. H., J. Rossant, M. Gertsenstein, M. L. Breitman. 1995. Role of the Flt-1 receptor tyrosine kinase in regulating the assembly of vascular endothelium. Nature 376:66. Gerber, H. P., A. K. Malik, G. P. Solar, D. Sherman, X. H. Liang, G. Meng, K. Hong, J. C. Marsters, N. Ferrara. 2002. VEGF regulates haematopoietic stem cell survival by an internal autocrine loop mechanism. Nature 417:954. Ohm, J. E., M. R. Shurin, C. Esche, M. T. Lotze, D. P. Carbone, D. I. Gabrilovich. 1999. Effect of vascular endothelial growth factor and FLT3 ligand on dendritic cell generation in vivo. J. Immunol. 163:3260. Fairchild, P. J., F. A. Brook, R. L. Gardner, L. Graca, V. Strong, Y. Tone, M. Tone, K. F. Nolan, H. Waldmann. 2000. Directed differentiation of dendritic cells from mouse embryonic stem cells. Curr. Biol. 10:1515. Seetharam, L., N. Gotoh, Y. Maru, G. Neufeld, S. Yamaguchi, M. Shibuya. 1995. A unique signal transduction from FLT tyrosine kinase, a receptor for vascular endothelial growth factor VEGF. Oncogene 10:135. Dikov, M. M., T. Oyama, P. Cheng, T. Takahashi, K. Takahashi, T. Sepetavec, B. Edwards, Y. Adachi, S. Nadaf, T. Daniel, et al 2001. Vascular endothelial growth factor effects on nuclear factor-κB activation in hematopoietic progenitor cells. Cancer Res. 61:2015. Osborn, L., S. Kunkel, G. J. Nabel. 1989. Tumor necrosis factor α and interleukin 1 stimulate the human immunodeficiency virus enhancer by activation of the nuclear factor κB. Proc. Natl. Acad. Sci. USA 86:2336. Oyama, T., S. Ran, T. Ishida, S. Nadaf, L. Kerr, D. P. Carbone, D. I. Gabrilovich. 1998. Vascular endothelial growth factor affects dendritic cell maturation through the inhibition of nuclear factor-κB activation in hemopoietic progenitor cells. J. Immunol. 160:1224. Mendel, D. B., A. D. Laird, B. D. Smolich, R. A. Blake, C. Liang, A. L. Hannah, R. M. Shaheen, L. M. Ellis, S. Weitman, L. K. Shawver, J. M. Cherrington. 2000. Development of SU5416, a selective small molecule inhibitor of VEGF receptor tyrosine kinase activity, as an anti-angiogenesis agent. Anticancer Drug Des. 15:29. Fong, T. A., L. K. Shawver, L. Sun, C. Tang, H. App, T. J. Powell, Y. H. Kim, R. Schreck, X. Wang, W. Risau, et al 1999. SU5416 is a potent and selective inhibitor of the vascular endothelial growth factor receptor (Flk-1/KDR) that inhibits tyrosine kinase catalysis, tumor vascularization, and growth of multiple tumor types. Cancer Res. 59:99. Gabrilovich, D. I., H. L. Chen, K. R. Girgis, T. Cunningham, G. M. Meny, S. Nadaf, D. Kavanaugh, D. P. Carbone. 1996. Production of vascular endothelial growth factor by human tumors inhibits the functional maturation of dendritic cells. Nat. Med. 2:1096. Gabrilovich, D. I., M. P. Velders, E. M. Sotomayor, W. M. Kast. 2001. Mechanism of immune dysfunction in cancer mediated by immature Gr-1+ myeloid cells. J. Immunol. 166:5398. Ohm, J. E., D. I. Gabrilovich, G. D. Sempowski, E. Kisseleva, K. S. Parman, S. Nadaf, D. P. Carbone. 2003. VEGF inhibits T-cell development and may contribute to tumor-induced immune suppression. Blood 101:4878. Almand, B., J. I. Clark, E. Nikitina, J. van Beynen, N. R. English, S. C. Knight, D. P. Carbone, D. I. Gabrilovich. 2001. Increased production of immature myeloid cells in cancer patients: a mechanism of immunosuppression in cancer. J. Immunol. 166:678. Schmitt, R. M., E. Bruyns, H. R. Snodgrass. 1991. Hematopoietic development of embryonic stem cells in vitro: cytokine and receptor gene expression. Genes Dev. 5:728. Keller, G., M. Kennedy, T. Papayannopoulou, M. V. Wiles. 1993. Hematopoietic commitment during embryonic stem cell differentiation in culture. Mol. Cell. Biol. 13:473. Senju, S., S. Hirata, H. Matsuyoshi, M. Masuda, Y. Uemura, K. Araki, K. I. Yamamura, Y. Nishimura. 2003. Generation and genetic modification of dendritic cells derived from mouse embryonic stem cells. Blood 101:3501. Gerber, H. P., K. J. Hillan, A. M. Ryan, J. Kowalski, G. A. Keller, L. Rangell, B. D. Wright, F. Radtke, M. Aguet, N. Ferrara. 1999. VEGF is required for growth and survival in neonatal mice. Development 126:1149. Kabrun, N., H. J. Buhring, K. Choi, A. Ullrich, W. Risau, G. Keller. 1997. Flk-1 expression defines a population of early embryonic hematopoietic precursors. Development 124:2039. Hidaka, M., W. L. Stanford, A. Bernstein. 1999. Conditional requirement for the Flk-1 receptor in the in vitro generation of early hematopoietic cells. Proc. Natl. Acad. Sci. USA 96:7370. Kennedy, M., M. Firpo, K. Choi, C. Wall, S. Robertson, N. Kabrun, G. Keller. 1997. A common precursor for primitive erythropoiesis and definitive haematopoiesis. Nature 386:488. Lacaud, G., S. Robertson, J. Palis, M. Kennedy, G. Keller. 2001. Regulation of hemangioblast development. Ann. NY Acad. Sci. 938:96. Gabrilovich, D. I., I. F. Ciernik, D. P. Carbone. 1996. Dendritic cells in antitumor immune responses. I. Defective antigen presentation in tumor-bearing hosts. Cell. Immunol. 170:101.